One of the biggest fights in years will have some extra meaning behind it. 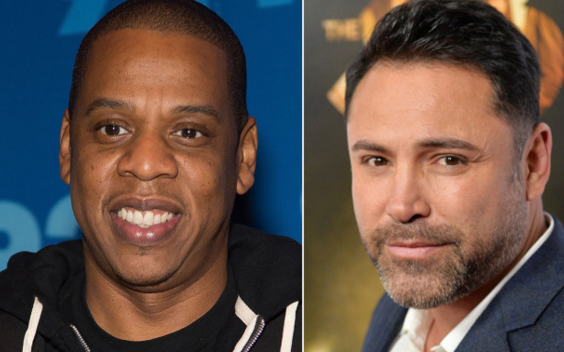 Oscar De La Hoya of Golden Boy Promotions and Jay Z of Roc Nation Sports are putting their money where their mouth is. Jay Z reps middleweight champion Miguel Cotto and De La Hoya believes in Canelo Alvarez. Both face off on Nov. 21 (HBO PPV) at Mandalay Bay in Las Vegas. One promoter will be $100,000 riche, according to Dan Rafael of ESPN.com. Each man agreed to put up $100,000 with the loser of the bet donating the money to the charity of the winner’s choice. If Cotto wins, De La Hoya will donate his cash to the Shawn Carter Foundation. And if Alvarez wins, Jay Z will donate his loot to the White Memorial Medical Center’s cancer unit. At most sports books, Alvarez is between a 2-1 and 3-1 favorite to defeat Cotto. On a conference call Tuesday, De La Hoya also predicted the fight would sell 1.5 million on pay-per-view. Alvarez is the betting favorite, but Cotto has been in a few wars.